ITV is hoping to capitalise on the success of its National Television Awards by launching a film award show. The inaugural National Movie Awards will be held at London's Royal Festival Hall on 28 September, and broadcast on ITV1 the following night. The winners will be chosen by the public from a list of the year's most successful films at the UK box office. 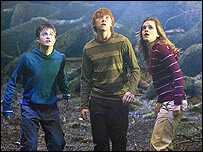 Shortlisted films include Spider-Man 3, Borat, Harry Potter and the Order of the Phoenix and The Simpsons Movie. Movies released between September 2006 and August 2007 are eligible, and categories include best family film, best action film, best comedy and best animation. Dame Judi Dench will go up against Casino Royale co-star Eva Green and Pirates of the Caribbean actress Keira Knightley for the best female award. Kirsten Dunst, Emma Watson and Transformers star Megan Fox are also in the running for the award. Eight actors are up for best male, including Bruce Willis, Daniel Craig, Shia LeBeouf and Tobey Maguire. Harry Potter cohorts Rupert Grint and Daniel Radcliffe are also nominated, as are Johnny Depp and Orlando Bloom. Votes can be cast online, over the phone or by picking up a form in any UK cinema. Organisers promise several other awards celebrating "cinema's greatest talent and screen successes". ITV is hoping to attract major Hollywood stars to the UK for the ceremony, which will be the first event of the awards season to look at the year's summer blockbusters. Just over seven million viewers tuned in to the TV awards last year, when Doctor Who won three prizes.